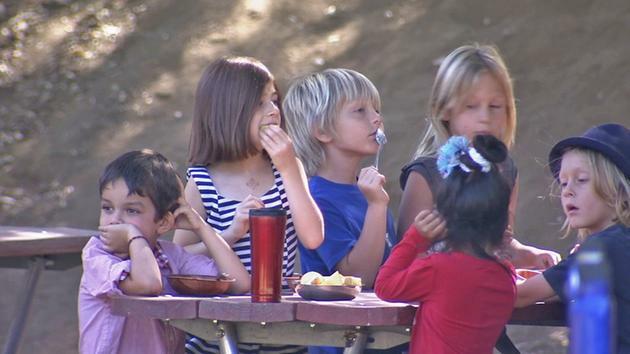 A private school in Calabasas will make history by becoming the nation’s first to implement a vegan diet by 2015. CALABASAS, CA –If you took the time to count all the garden beds at MUSE School in Calabasas, you’d find nearly 50 between its two campuses. The students not only eat their own school-grown veggies, they do a lot of the work. “They’re in the gardens, they’re getting dirty, they’re planting the seeds, they’re watching the vegetables grow,” said Suzy Amis Cameron, wife of director James Cameron. Since 2006, she and her sister, Rebecca, have run their environmentally-conscious schools, starting with early childhood education, up through middle school and soon expanding to high school. And let’s just say, the students can eat. “If you could see them during lunch, their plates are full of vegetables,” said Rebecca Amis. Right now, the students are eating one lunch a week that is completely plant-based, like fresh salads and polenta casserole. By the fall of 2015, the vegan diet will expand to five days a week, making it the first school in the nation to do so. Some of the kids admit they’d miss their meat. “I’m not going to lie, but I think it’s just, I don’t know how to say it, I think it’s just better to eat healthy,” said one student. The Amis sisters say they are not trying to convert their students, and it goes beyond a healthy diet — it’s their effort to reduce the school’s carbon footprint. “We walk our walk in so many areas and this just takes us to another level,” said Amis Cameron. click here to see the video of this entry.